Fair Winds Press, 9781592336821, 208pp. Ferment Your Vegetables for Flavor, Health, and Fun! Fermented vegetables are a great, healthy addition to anyone's diet. Abundant in probiotics, enzymes, vitamins, minerals, and more, research continues to reveal the many ways that these foods positively contribute to our well-being. From kimchi and sauerkraut to pickles and kvass, fermented foods have been part of the human diet for millennia--and are rightfully reclaiming their place at our daily table. 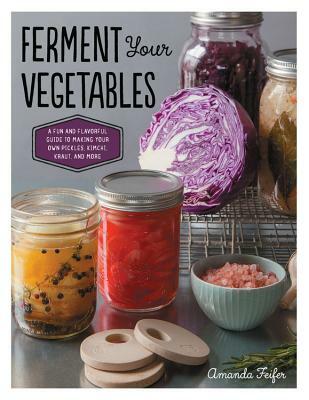 Amanda Feifer writes about food fermentation of all kinds on her blog, phickle.com, and is the author of the cookbook Ferment Your Vegetables. When she's not concocting crazy vats of bubbly things in the kitchen or ranting against the use of anti-bacterial soaps, she's doing what she loves most: teaching people to make their own fermented foods, from kimchi and kefir to kombucha and koji. She was selected to be a judge for the 2016 Edible Communities EDDY Awards.